Look here for news updates on the aftermath of a 7.0 earthquake that struck Haiti. 10:49 p.m. -- The Argentine Foreign Ministry said in a statement that the Argentine Mobile Military Hospital -- which they say is the only hospital functioning in Port-au-Prince -- has treated more than 800 people. Argentine Armed Forces helicopters are helping evacuate the "gravely injured" people to Santo Domingo, in the neighboring Dominican Republic. Argentina also plans to send an airplane with aid to the area, the statement said. 9:54 p.m. -- The people of Jacmel, Haiti are lining the streets, setting tires on fire to light up a town that has been reduced to rubble in many parts and is without power. The flames are all that illuminate what remains of this town on the southern coast of Haiti, about 25 miles from the capital Port-au-Prince, Haiti. 9:45 p.m. -- The New York Yankees announced a donation of $500,000 in support of rescue and relief efforts following the tragic earthquake in Haiti. 9:00 p.m. -- The Dominican Republic was the first country give aid to Haiti in the aftermath of Tuesday's devastating earthquake. 8:54 p.m. -- "Simply getting through the streets to collect the dead bodies is seemingly an impossible task," CNN's Dr. Sanjay Gupta reports from the capital, where shooting could be heard in the background. "There's hardly any heavy machinery to try and dig through the rubble -- people are doing it by hand." 8:32 p.m -- 16 members of the Brazilian-led peacekeeping force deployed in Haiti are confirmed dead, U.N. Secretary-General Ban Ki-moon says. 4:44 p.m -- The main airport in Haiti appears to be operable, which should enable foreign aid to start flowing into the country in the wake of the powerful earthquake that slammed the impoverished nation late Tuesday afternoon. 4:37 p.m -- Former President Bill Clinton, U.N. special envoy to Haiti, speaks to United Nations on the devastation. 4:08 p.m -- Haitian President Preval: "You have to see it to believe it. Lots of houses destroyed, hospitals, schools, personal homes -- a lot of people in the street, dead." 3:57 p.m -- The Haitian consul general to the United Nations, Felix Augustin, told reporters Port-au-Prince is "flattened." 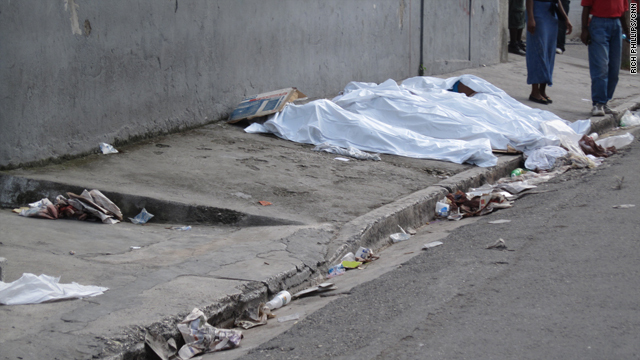 3:55 p.m -- Haitian President Rene Preval told CNN's Dr. Sanjay Gupta in Port-au-Prince that he had heard that 30,000 or 100,000 people had been killed in the earthquake, but added "it's too early to give a number." 3:53 p.m. -- U.S. Senator Jack Reed (D-RI) today released the following statement regarding the earthquake in Haiti: "Like all Rhode Islanders, my heart goes out to the people of Haiti and Haitian-Americans who are struggling with the devastation and loss of life following yesterday's earthquake. "President Obama has mobilized U.S. Coast Guard ships and aircraft and is sending additional resources to help with the relief effort. "I have been contacted by several families who have relatives in Haiti, some of whom were expected to return to Rhode Island within the week. My office continues to coordinate efforts with the State Department, the American Citizen Service Unit at the U.S. Embassy in Port-au-Prince, the Haitian Consulate in New York, and the Haitian Embassy in Washington, DC. "I have also received many calls from Rhode Islanders wanting to help. Those wishing to help should contact the Red Cross, which is only taking cash donations at this time. Additionally, a volunteer list is being formed and there are efforts underway to help volunteers who have been trained in disaster relief to travel to Haiti, if needed. "I encourage Rhode Islanders who need assistance contacting family members and loved ones in Haiti to contact my office." 3:43 p.m -- Haitian President Rene Preval to CNN's Dr. Sanjay Gupta: "We don't have the capacity" to bring all the injured to hospitals. 2:04 p.m. -- Want to more about Haiti? Check out this interactive snapshot. 12:41 p.m. -- Photo gallery shows the destruction. 10:24 a.m. -- USAID Administrator Raj Shah will coordinate American relief efforts, Obama says. 8:53: a.m. -- President Obama to make statement on Haiti at 10 a.m. ET. 7: 30 a.m. -- Reconnaissance flights to go over Haiti soon, says U.S. State Department spokesman P.J. Crowley. 3:40 a.m. on January 13, 2009 -- Residents hunkered down for the night, awaiting daylight to ascertain full scope of devastation. 11:45 p.m. -- "Can hear people gathered in the distance singing prayers," wrote Richard Morse, hotel manager at the Oloffson Hotel, wrote on Twitter. 6:50 p.m. -- Tsunami watch cancelled. 5:14 p.m. on Jan. 12, 2009 -- A magnitude 7.0 earthquake struck southern Haiti, the U.S. Geological Survey reported.